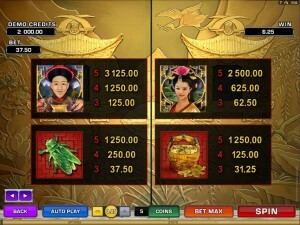 Designed by Microgaming, Tiger Moon is a Chinese themed game with the focus being on things that are from that country. The tiger is present among the symbols, but there is no explanation about its connection with the moon. It’s also a game with a rather bland design, which is not good for it since it has a lot of incredible looking competitors with a similar theme. 243 paylines are available on Tiger Moon’s 5 reels. 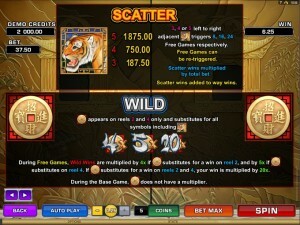 Free spins, multipliers, wilds and scatters, these are the game’s main features. It offers a maximum payout of $3,125. 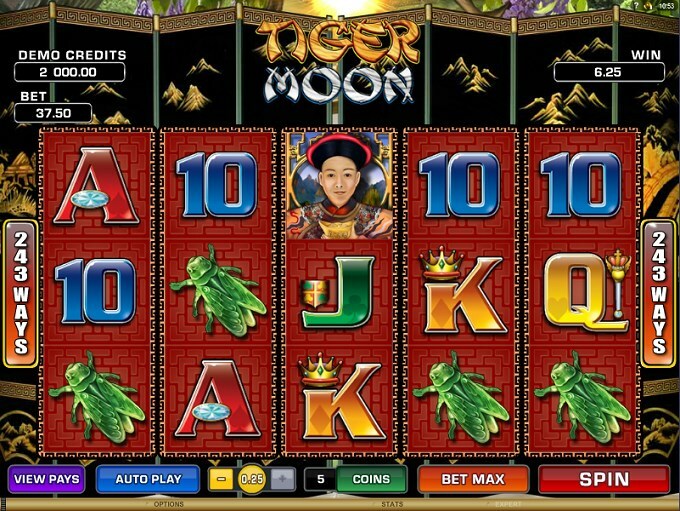 The features of Tiger Moon will give you wild symbols, scatters, free spins and some incredible multipliers that go as high as 20x. 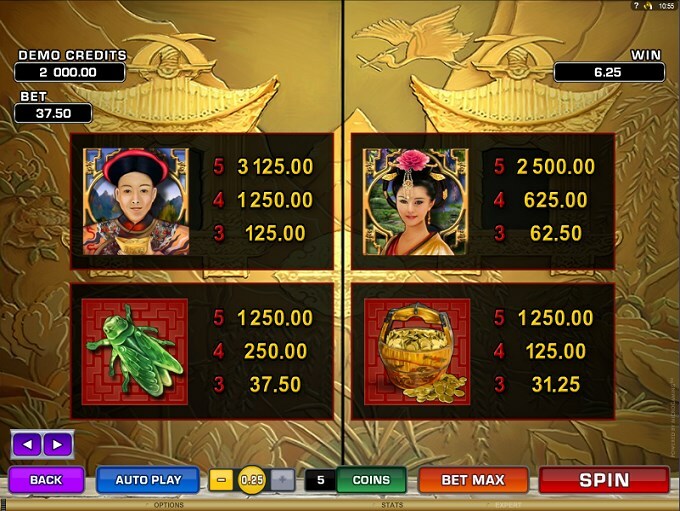 You’re getting 243 ways to win, so you can form combinations of symbols simply by having them on the correct reels, without appearing in fixed positions on a payline. You get a lot more wins this way, plus the free spins have some very big multipliers from the wilds. The Chinese Coin is the wild symbol and, while it is reserved only for two reels out of five, it gives incredible value if you’re lucky enough to take advantage of its substitution ability. Since only two reels can get it, there are no prizes offered directly by the wild. If you get wilds during the base game they simply substitute for other symbols. The free spins are different though, as they offer you multipliers of 4x when the wild contributes from a position on the 2nd reel and 5x when the one from the 4th reel is used. If both wilds are part of a combo, then they combine multipliers, and an incredible 20x is applied to the win. 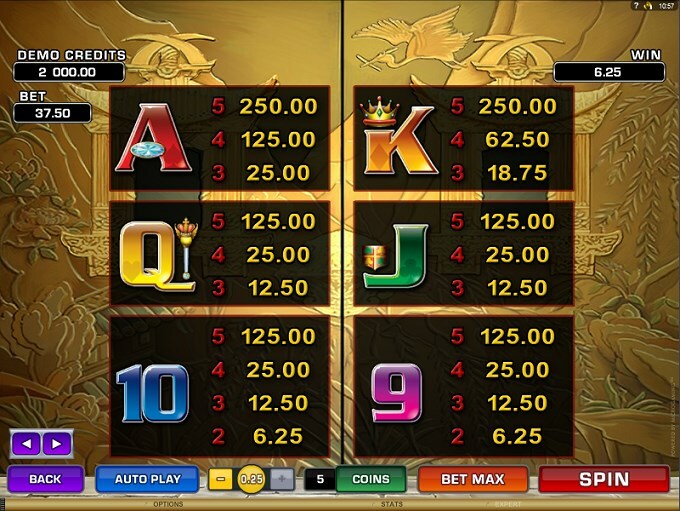 High multipliers like this one are quite rare, so I try to take advantage of them when I see them in slots. The Tiger is the other important symbol in Tiger Moon, used as the scatter feature which triggers the free spins and as a way of getting other prizes. Depending on the number of scatter symbols, you can get prizes of 1x to 100x the wager value. You need 3 to 5 scattered Tigers for that to happen. You also can get free spins in Tiger Moon, between 8 and 24 rounds, when you have three to five symbols with Tigers in them. You can retrigger these free spins, plus you get the wilds with the huge multipliers, which I mentioned above. Since it wouldn’t be practical to wager on 243 ways to win, the game uses 30 lines for wager purposes. 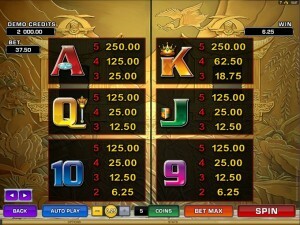 The line bet decides how much the prize of a way to win will be worth, the multipliers applying to it. Up to 5 coins may be used on one of these lines, with values reaching $0.25. That’s a $1.25 maximum line bet, while the total is $37.50. You can win 12,500 coins in the game, or 2,500x the line bet. The cash value will be at $3,125. It might seem like a low prize, but since there are so many ways to win it’s a pretty normal reward. My least favorite part of the game would be the way its design was made. It looks Chinese, there is no question about that, but there are too many elements which seem rushed. The playing cards would be part of the problem, found in dozens of other slots in exactly this form, so they made absolutely no effort with them. The background picture with the red tiles looks decent, as does the black background with the painted mountains. The symbols seem to be the real problem here. Symbols: Tiger (scatter, 50x the bet), Chinese Coin (wild), Emperor (2,500x), Princess (2,000x), Grasshopper (1,000x), Gold Coins (1,000x), Ace (200x), King (200x), Queen (100x), Jack (100x), 10 (100x) and 9 (100x). I’m personally not a fan of the game, even though it offers good prizes and ways to win. The design is the one I’m annoyed with, while the big multipliers which the wild has during the free spins would be the exciting part. 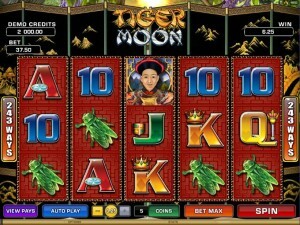 Tiger Moon can be found at any Microgaming casino, where you get a chance to play it for real money or in free mode.